If you could host a dinner party for any four people (dead or alive), who would you invite and what would you serve? Quite a number of readers shared they would like to host a dinner party with relatives who have passed on and others chose some great celebrities! It was great to read through and learn more about those people that interest you and your loved ones! As for what readers would serve during their dinner party, it was clear that comfort food was a popular choice! Others opted for a grand meal with all the stops. For me, the people I would invite would include Jack Black, Andy Samberg, Dave Chapelle and Tina Fey. I enjoy company who make me laugh and these guests would have no trouble making it a fun night! 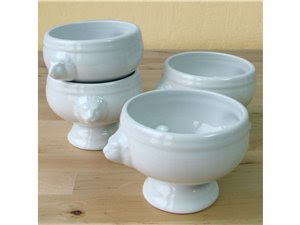 The Lion Head Soup Bowl set (set of 4) have a 16-oz. capacity and can be used under the broiler. This makes them perfect for French Onion Soup. 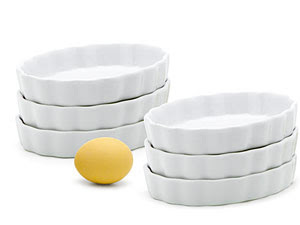 Once you've begun using these Oval Quiche bowls dishes (set of 6), you'll be pleasantly surprised to learn how very versatile they are. Not only can you bake in them, you can also use them for serving (the white porcelain blends in well with your other dishes). And for cleaning, they go right into your dishwasher. The set of 6 lets you make individual portions for everyone at the table. 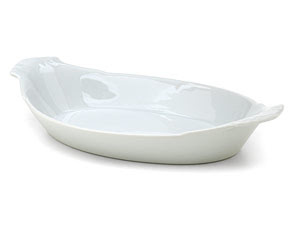 Once you've begun using this Au Gratin dish (set of 2), you'll be pleasantly surprised to learn how very versatile it is. The oval dish measures holds 24-oz., great for casseroles, rice dishes, vegetable sides, cobblers and roasted chicken, too. It is always sad to me when I move, even when I am excited to go to the new place. My paternal grandmother (she died in childbirth), Wayne Gretzky, Steven Colbert and author Jen Lancaster. Congratulations Peabody! I look forward to seeing what delicious concoctions you'll be making and serving up in one of these sets! Please email me at [email protected] so I can confirm the mailing address in which to have your BIA Cordon Bleu set sent to. Thanks again to all those that commented and stay tuned to the next Foodie Freebie announcement on Monday,March 16, 2009! Don't feel discouraged if you haven't won yet - I have a whole year's worth of freebies ahead and next week is one that you won't want to miss! I would have dinner with Obama, FDR, Churchill and Tim Russert and serve pizza quickly so we would have more time to talk politics! I just stumbled upon your blog (it showed up as a recommended link on google reader), and I've really have enjoyed reading through your recipes. Love your blog! I'm actually sort of sad because I used to live in Chicago and just moved to Boston a year ago, so I can't join your group. Looks so fun! Holy Cow! Really? I never win anything!